Since most of my colleagues will go on leave in a few days time, I've decided to send out an early Valentine's Day message to some of my closer colleagues. This year's gift will be a rather simple one (plus it's not personalized :( ). It's not hand-made (unfortunately, due to the lack of time on my schedule...AND the lack of ideas as well! ), but I thought it'll just be nice to hand out a 'lil gift to those whose company I enjoy. Thanks everyone for your friendship! 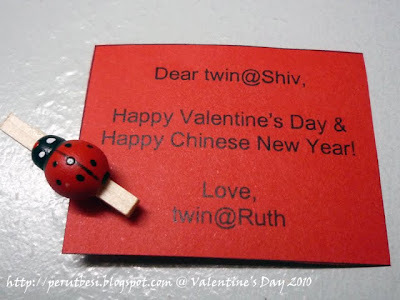 Thank you Ruth for sharing such beautiful gift card creation.So cute indeed.Wish you in advance a Happy Chinese New Year n Happy Valentine's day ahead. More Valentine Gift Ideas!|Hot Deals,Learn More! aww, it's the thought that counts! happy vals day.. and happy CNY! Dear Ruth, Happy Valentine’s Day !!! ->HenRy LeE: Thanks, Henry! Wish I had more time to make even nicer gifts like the past few years! ->avagdro: Hi there! Welcome to my blog :) Thanks for your comment! Happy Chinese New Year & Happy Valentine's Day to you too!! ->C & C: Mei! Happy CNY & Happy V-Day to u & Cumi! 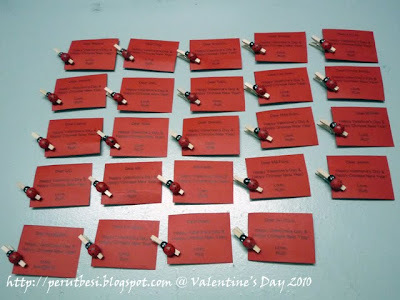 ->Johan Donald: Thanks for dropping by my blog :D Happy Valentine's Day to u too!! !